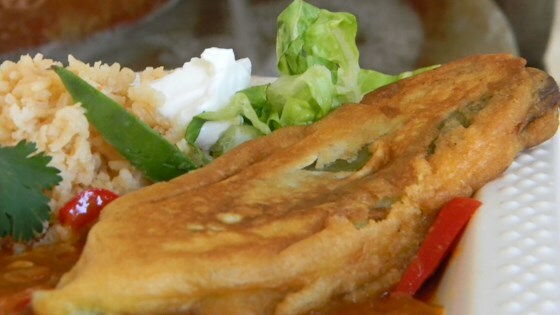 "This is an authentic Mexican recipe that has been handed down for generations in my family." The nutrition data for this recipe includes the full amount of the flour for breading. The actual amount of the breading consumed will vary. OMG this was delicious! Pretty easy, too. I just won't leave the charred peppers sit for more than 15 minutes. I let them sit for an hour and they ripped very easy. thanks! Great recipe! Just to add, I'm from Louisiana and will use any darn chili I want to. Authenticity is second to how it tastes here. Delicious! Perfect texture! I froze the stuffed chilis before coating them to make them easier to handle.